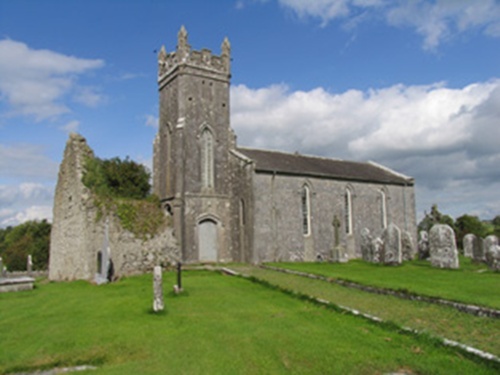 Modreeny Church of Ireland Churchyard lies between Cloughjordan and Borrisokane. There are 2 Commonwealth burials of the 1914-1918 war here. M/39117 Serjeant James Somers, V. C.
1st Bn.,Royal Inniskilling Fusiliers, Army Service Corps, died 7th May 1918, aged 24. Son of R. W. Somers, of Cloughjordan. Citation: An extract from the supplement to "The London Gazette," dated 31st Aug., 1915, records the following:- "For most conspicuous bravery on the night of 1st-2nd July, 1915, in the Southern Zone of the Gallipoli Peninsula, when, owing to hostile bombing, some of our troops had retired from a sap, Serjeant Somers remained alone on the spot until a party brought up bombs. He then climbed over into the Turkish trench, and bombed the Turks with great effect. Later on he advanced into the open under very heavy fire and held back the enemy by throwing bombs into their flank until a barricade had been established. During this period he frequently ran to and from our trenches to obtain fresh supplies of bombs. 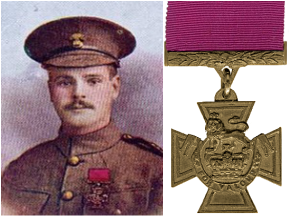 By his great gallantry and coolness Serjeant Somers was largely instrumental in effecting the recapture of a portion of our trench which had been lost." Private 7993 Charles Merrit, Royal Irish Regiment, died 19th May 1915.